This is the time of year that a lot of attention is given to building lobbies and entranceways. Holiday themes are developed. Decorations are installed. And building managers put extra thought into the appearance that their building presents to the public. Why is so much importance placed on the lobby area? For retailers, sales are directly affected by their appearance because attractive entranceways draw attention. For hotels, casinos, and any public places, first impressions also matter. The quality of your entrance area and lobby directly reflects on how well a building is being managed and what visitors can expect in other areas of your property. First, evaluate the current condition of your building lobby/entranceway. Assess all of your furnishings, including waste receptacles & recycling receptacles, smoking posts, carts, crowd control stanchions, sign stands etc., both indoors and out. Are all of these items in good working condition? Are any of your furnishings worn, tarnished or in need of maintenance or replacement? What anticipated needs might you have for 2014 that you did not have in 2013? 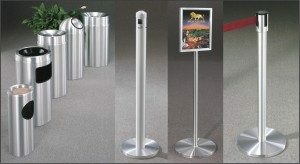 Second, assess the overall performance and effectiveness of lobby equipment. Are receptacles large enough? Are there enough recycling stations? Are smoker’s posts meeting your standards? Is your signage sufficient? Are there enough carts with enough capacity to handle peak traffic periods? Is equipment easy to use and easy to maintain? For example, if you have a bellman cart that is difficult to push and pull, consider replacing it with a cart that has pinpoint maneuverability and a more ergonomic design. If your receptacles tarnish, consider an aluminum receptacle with a tarnish proof finish to save on maintenance expenses. Finally, evaluate the overall appearance of your lobby area. If your lobby was originally furnished as one large project, then your overall décor may be well coordinated. However, if a lobby was furnished piecemeal, as items are added and taken away over the years, decor may become mismatched. Or, the overall aesthetic may suffer. American manufacturers such as Glaro Inc. are able to solve this problem by uniquely providing matching finishes across product lines so that all of your equipment can match and present a more harmonious, “designer” look. Keep building visitors happy and feeling welcome by making sure you can meet and exceed their expectations in 2014. Happy Holidays from Glaro Inc.!